Yesterday, for lunch, beloved and I ate at Aveneto. This is one of the more overdue nomnom adventures we’ve had, since we’ve been here more times than I can accurately remember. And if you’re a mall-goer or live in the vicinity of Visayas Ave., you’ve probably at least heard of this resto, if not have eaten in it. If not, well, you can probably assume from its name that it’s Italian, and it is. Being an Italian restaurant, they specialize in pizzas and pastas, but also have some nonstandard Italian fare ranging from their appetizers and their hero sandwiches (then again, maybe the latter is also Italian). This restaurant has a lot of branches, and I’ve been to most of them. The particular one we ate at yesterday was their Trinoma branch. When we go here, it’s usually full because it’s dinner time. Their lunch hours are the opposite of that, and we were practically the only table when we came in. Aveneto is a place you don’t go alone, or even on a date. You go here in groups of maybe at least four simply because of the serving sizes. This is one of the places me and my friends go to when there’s an occasion and have no particular place in mind because it’s a pretty good value if you’re in a huge group. Their pastas are good for at least two, and their pizzas, even the smallest, can be shared by four (assuming you ordered pastas on the side). A good thing, though, is that like most Filipino franchises, they allow taking home of your leftovers with no extra charge. That thought in mind, we decided to order a pasta, a small pizza, and a couple of appetizers. Beloved wanted their Deep Fried Crabsticks (190 Php), and I wanted their French Fries (55 Php). Because their appetizers platter, which contains cheese balls and chicken wings aside from the aforementioned, has less crabsticks than she wanted, we just ordered them separately. 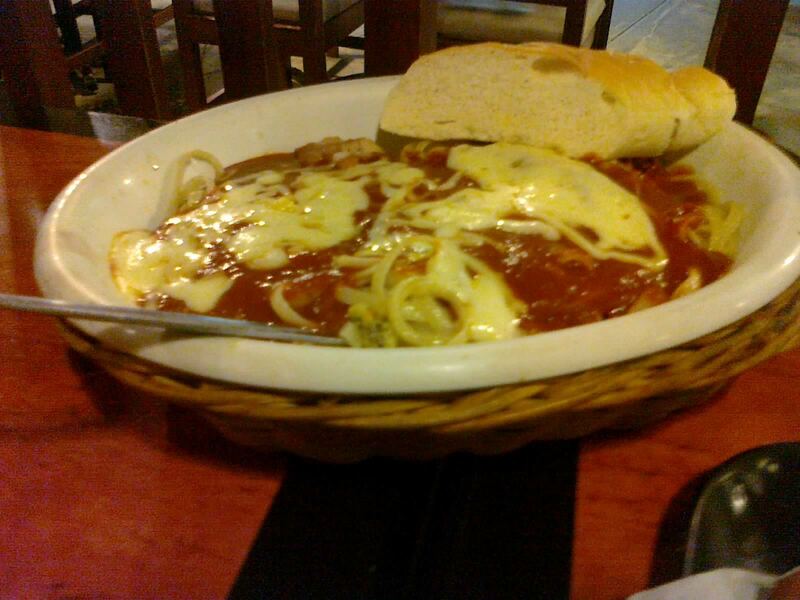 As for our pasta, we ordered their Seafood Pasta Parmigiana (250 Php) on thick noodles, which is basically seafood pasta in red sauce. Our pizza of choice was their small Vegetarian Pizza (240 Php), because it was basically the only choice we had that has mushrooms, no seafood, and sounded complementary to what we ordered. Their Refillable Iced Tea is priced at 65 Php, and we ordered one for each of us. 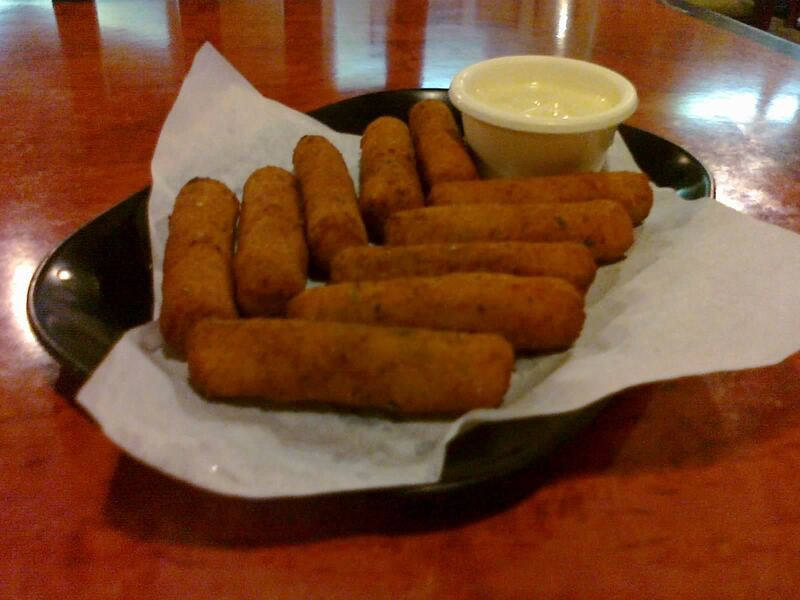 Our appetizers came after a short wait. The crabsticks were breaded, but was void of any oily deep-fried taste or texture, which made it not-so-tiring. There is a distinct strong taste of the breading, but the soft crabstick core was enough to make beloved happy. And there’s ten of them, another reason for beloved to be happy about. The sauce that came with it is a garlic mayo one, that certainly complements the appetizer well. 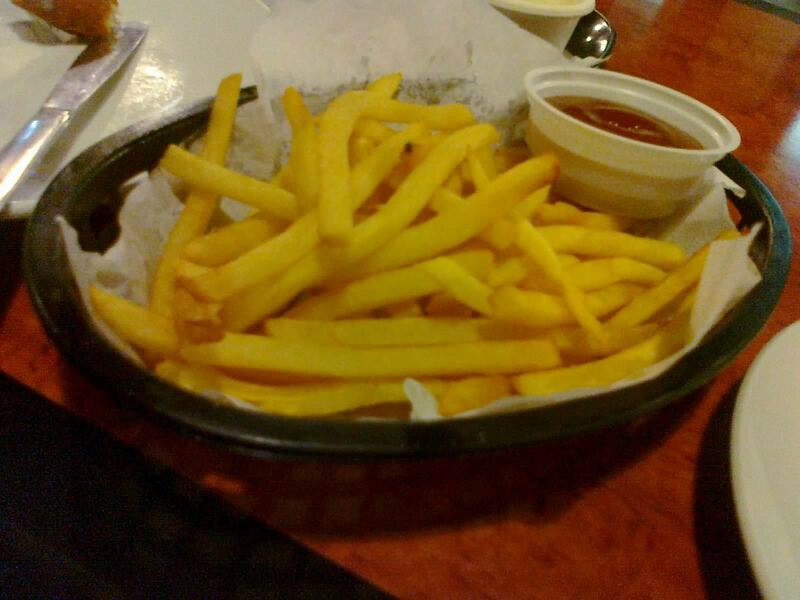 As for my fries, well, it’s pretty much the same as any fast food or side stall fries you can get, only less oily. The serving’s pretty decent, comparable to the one at McDonald’s with the same price tag. But, hey, when you’re craving for fries, it’s good to know that it’s among the items in the menu, even if it’s an Italian resto. Our pizza came next. Their small size is ten inches in diameter—a bit smaller than that of Friuli, but still enough for two to four. One thing I love about their pizzas is the stringiness of the mozzarella they use. Yes, it’s a bit tasteless compared to some other pizzareas, but the stringiness makes up for it. This makes the toppings and the crust shine taste-wise. While the crust isn’t really something memorable, the toppings they used in this veggie pizza were very fresh and were practically raw. Of course, these veggies are a bit on the bland side as well, being veggies, but it’s nothing a little bit of salt and pepper can cure. I am a bit disappointed that the olives didn’t have that usually strong olive taste, but I guess the meatiness of the mushrooms make up for it. A few moments, and the pasta came. The serving, as I’ve mentioned, is huge. I doubt a normal human being can consume this much pasta in one sitting. The server also warned us that the container was hot, and it’s a good thing too, because it won’t make the pasta colder than it should be. Although the serving was nice, I found the bits of seafood in this particular plate a bit on the bitter side. The sauce was okay, and the pasta was al dente—it’s just the seafood that didn’t really agree with me. Of course, I’m not really a huge pasta fan, so I’m happy with the pizza. It’s worth mentioning that they topped it with the same mozzarella they used on their pizza which adds the wonderful stringiness to the plate. Because we ordered a lot, we expected a lot of leftovers. And we did, which concludes another Aveneto experience. I’ll be up front, however: although we’ve been here a lot of times, Aveneto isn’t really my favorite Italian place. Their pizzas and pastas are certainly a better value than, let’s say, Italianni’s. But their pizzas and pastas aren’t that special to me as well. I find Bigoli, even though the pizzas are laughable visually, to have a much more special pizza just because their crust is wonderful. I even find myself craving for the thin crust Garlic and Cheese or Manager’s Choice pizzas of Shakey’s, or even the Stuffed Crust pizzas of Pizza Hut, or the Four Seasons pizza (and Twice-Baked Potato Halves, but that’s not pizza) of Yellow Cab. 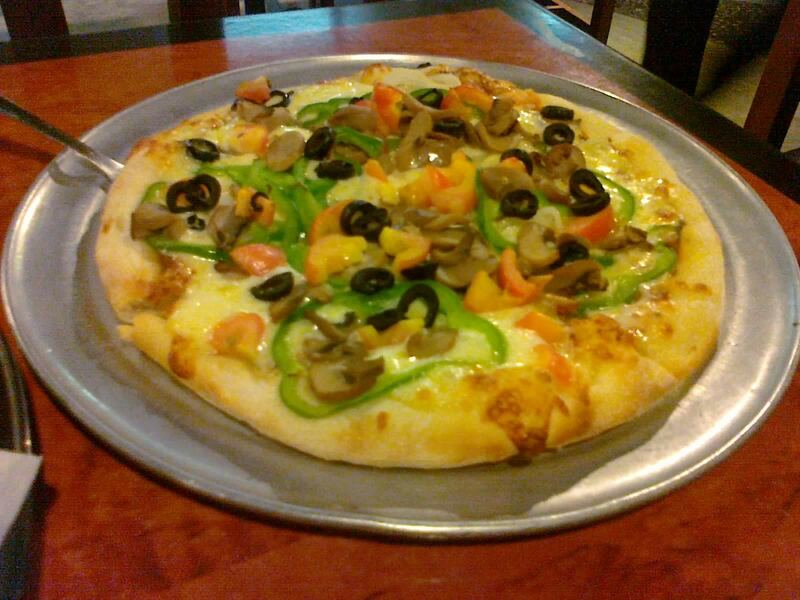 On the other hand, I never once have craved for the pizzas of Aveneto. Heck, I can’t even remember the entire name of any of their pizzas. And although I love the stringiness of the cheese they use, I find that stringiness in a lot of other pizza, pasta, or even burger places. For others I know that love this place, they say Aveneto has wonderful pasta. However, as I’ve mentioned, I’m not really into pasta. I guess what makes Aveneto special to me is the company and the memories that the many times we’ve been here has allowed me to experience. That said, I expect to be back here just because. Location: Trinoma, 2nd Floor al fresco area. Budget: 200-500 Php per head. Recommended for: Stringy mozzarella lovers, pasta lovers. Smart nomnomnom tip: You can order their pizzas in different flavors on one pizza—most I’ve ever tried was four different flavors on their large.